Shedworld: Beta Shed - Follett's Folly? 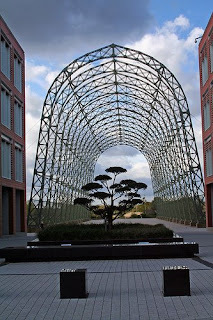 A portable airship shed frame in Farnborough, Hampshire has been listed at Grade II by Culture Minister Barbara Follett ('That'll be Ken's Mrs, then," says Shedman.) It was cut in half in World War Two and has been put back together. See the background at The Great War Forum. Such sheds were used to house airships, or balloons, which provided air observation of German submarines during World War I, monitoring threats to all shipping, including supply convoys, in the North Sea and the Channel. Only a handful of portable airship sheds are known to survive throughout Europe, and this is the only frame known to survive from the pre-World War I period. As she listed the frame of the airship shed, Culture Minister Barbara Follett said: "This is a most unusual and unique building and deserves preservation. Only six of these sheds existed at the beginning of the First World War, and this one has housed some truly remarkable examples of British engineering. Its links with the development of early aerial reconnaissance is a reminder of a critically important time in Britain's aviation history and it deserves the extra protection that listing brings."